1992 Impel USA Olympic rings logo gold hologram card autographed in blue marker and dated 1968 for her gold medal year by legendary figure skater Peggy Fleming. Obtained in person. 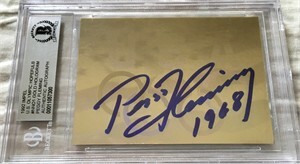 Authenticated by BAS (Beckett Authentication Services) and slabbed. ONLY 2 AVAILABLE FOR SALE.